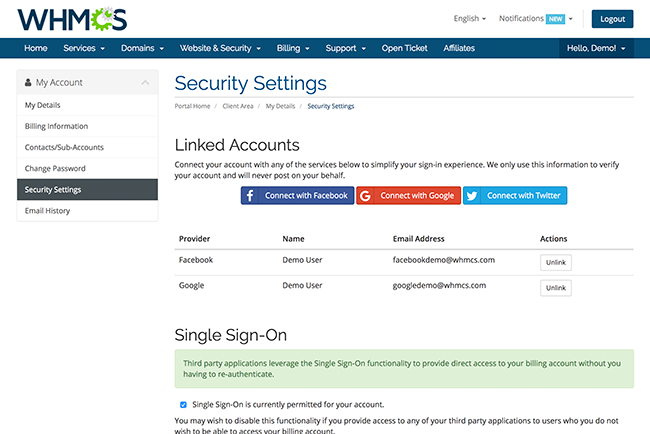 With WHMCS 7.3, your customers can save time and reduce the number of logins they have to remember by signing in using their Facebook, Twitter and Google accounts. Linking an account is easy and takes seconds. After that, users can login seamlessly, often requiring nothing more than a click since users will already be authenticated with the providers. When enabled and placing an order for the first time, users have the option of signing up using any of the supported sign-in providers. When a user chooses to do this, order form checkout fields will be automatically pre-filled with information made available by the sign-in provider, and upon completion of checkout, a link between the users WHMCS account and their chosen sign-in provider will be automatically established. For existing users, when logging in, they have the option of signing in using any of the supported sign-in providers. When a user chooses a sign in option for the first time, if no linked account is found in WHMCS, the user will be asked to login to their WHMCS user account to establish a link. All future logins will be instant and automatic following the link having been established. Users also have full access to manage, link and unlink linked accounts from within the client area. Simply by navigating to the Security Settings area, users can unlink accounts as well as connect with new ones to simplify future logins. In all cases, Sign-In providers are designed to make it easier for users to login. By leveraging Sign-In Integrations, customers can sign up faster, and don't have to remember yet another password for your site. Sign-In Integrations with Facebook, Twitter and Google are available in WHMCS 7.3 which is out now in beta. Get involved today to be among one of the first to try the new functionality.